If you weren't prompted to block this popup, then PopupPopper probably isn't installed. You are using Internet Explorer 5.01 or later, right? 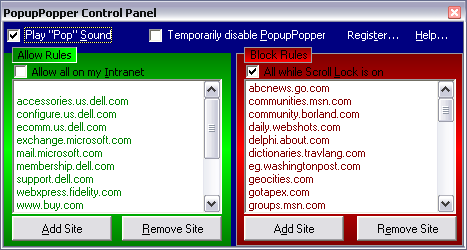 PopupPopper is not compatible with MSN Explorer, Netscape, Mozilla, or embedded AOL. Note that IE 5.00 has a bug which prevents PopupPopper from loading. Make sure you don't hold down the CTRL or SHIFT key while clicking links unless you want to allow popups. From the START | Programs menu, click . Watch for any error messages. Ensure the "Temporarily disable PopupPopper" box is NOT checked. Verify that you hadn't previously selected Allow all from site for www.bayden.com. Warning: Some software, in particular GATOR, is not compatible with PopupPopper. GATOR continually makes changes to your registry which are incompatible with PopupPopper. If you wish to use PopupPopper, please uninstall the spyware using LavaSoft's Ad-Aware.